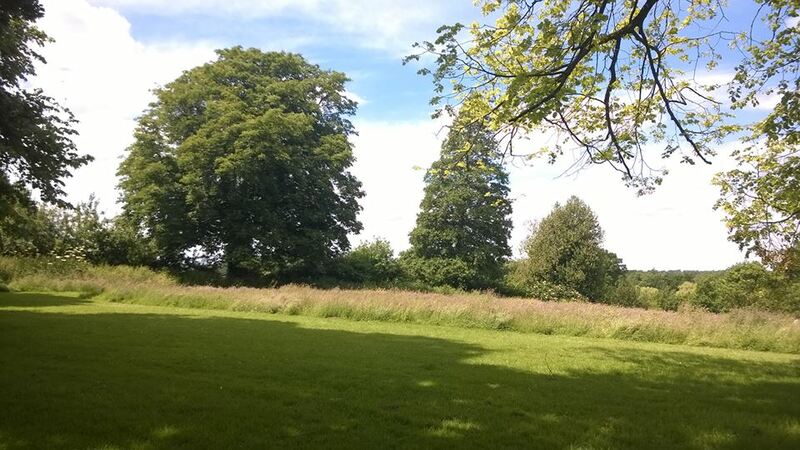 Just to let people know that the shop will be closed on Tuesday and Wednesday this week (23 and 24 June) – hoping to reopen on Thursday, but will have to see how the week goes! Apologies for any inconvenience. All set for our own adventure with a lost Nick Drake recording. 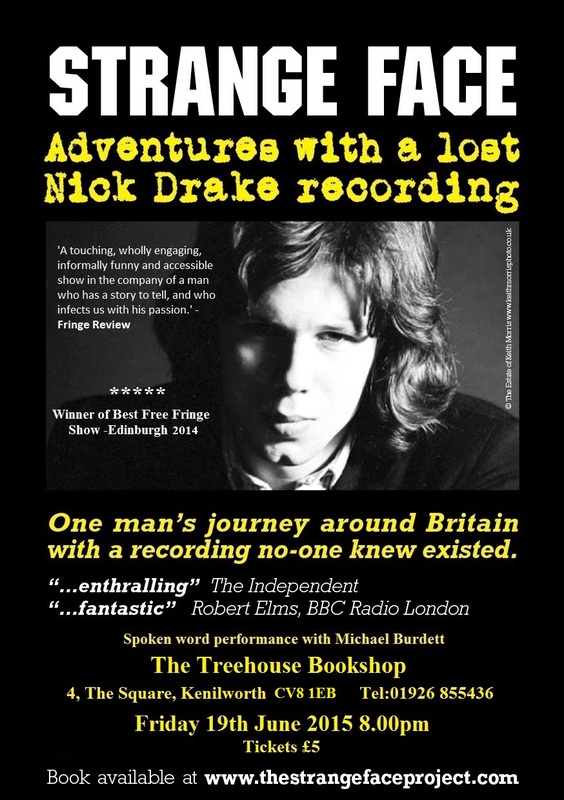 In my last post, I waxed lyrical about Nick Drake and the Strange Face project and the fact that its author, Michael Burdett, was coming to the Tree House. 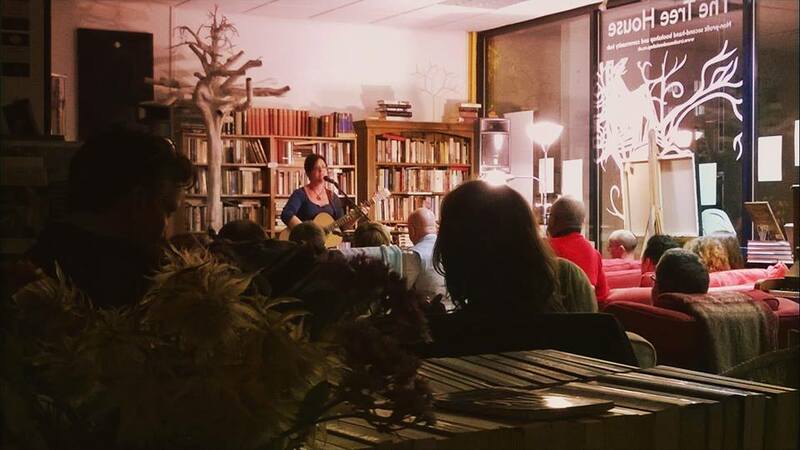 Friday evening’s event turned out to be even more wonderful than expected, and it was brilliant to see the bookshop full – nearly 30 of us, and lots of people who had not been before, too, as well as some of our regulars. Lovely! Michael’s talk isn’t like anything else I’ve experienced. It is forty years since Nick Drake’s death, and in that time so much has been written about him that you would think there was nothing new or original to say – yet Michael’s project and what has come out of it is a deeply inspiring contribution to Nick Drake’s legacy. It’s hard not to get emotional when you listen to or talk about Nick Drake. Whenever he is mentioned, his early death is usually there in the opening sentence. The fragile, ethereal quality of his voice and his songs and his photogenic beauty combine to make that tragedy still raw even after forty years. But what Michael’s project does is to distil all of that into something genuinely meaningful. 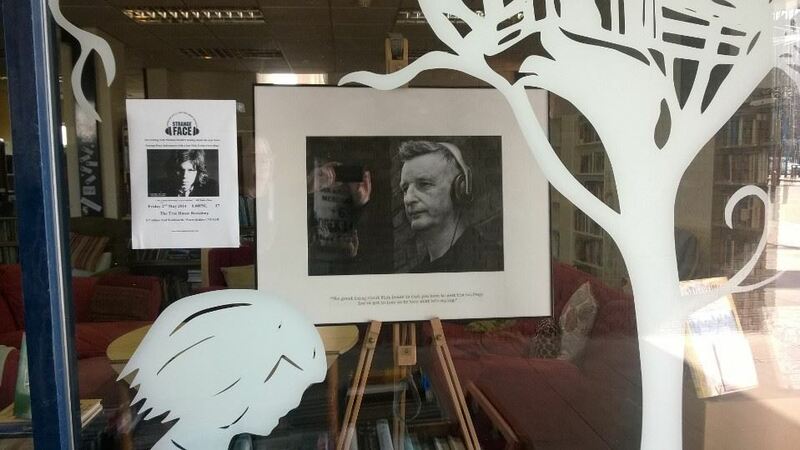 He shows us photographs of a wonderful variety of people listening to an unreleased Nick Drake recording and talks about the moment he shared with these people, and what comes across is the extraordinary power of music to connect people with themselves and with each other. This level of impact that music can have is too frequently undervalued. Michael claims not to know how to use a camera, but the photographs are stunning, and this visual power alongside the adventure that Michael recounts through the cumulative effect of his project makes for an unforgettable experience. We laughed, we cried, we were given surprises and we were made to think. Michael’s passion and emotional engagement came through time and again, and what I loved the first time I heard this talk came through even more strongly on Friday night – a sense of community, between all of us in the room and the people in Michael’s story. Nick Drake remains an elusive figure, and while he was there in every moment, he was never the actual focus, and this in itself is one of the glories of the show. The photographs capture the moment when privacy and public engagement meet, an uncomfortable but compelling experience and one that is entirely appropriate to our fascination with Nick. There is an immediacy and yet a sense of things being off to the side, ungraspable – and this is surely at the heart of any great human experience. They also capture the relationship between diversity and universality, another fundamental relationship within our human condition. It is difficult to convey the subtle power of Michael’s show, but it is real nevertheless. 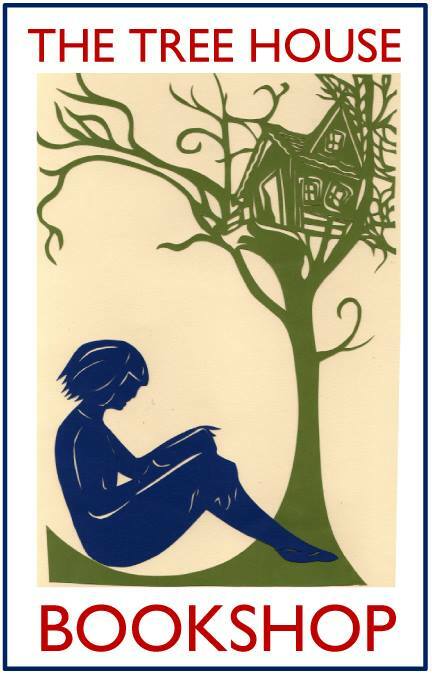 The Tree House is about community in this sort of subtle way – finding ways of bringing people together that are meaningful and profound. Music does this, which is one of the reasons we put on live music gigs. Talks about music can clearly also do this! Michael has become a friend since he first gave the talk at the Tree House last year, and I know of specific instances where people have connected and friendships have been made through coming together to listen to this talk. There is a level of integrity in the way Michael handles the recording he found and the people he encounters through it that is profoundly refreshing in our world where most things can be bought for a price and so many things are devalued by overexposure and commercial motives. I can’t praise the talk highly enough, and if you get the opportunity, do go and listen to it. It is of course utterly fascinating for those who are fans, but it transcends any interest in Nick Drake – it’s about something more universally human than musical taste or the hagiography of one individual. Yet it is also a homage to the power of those three beautiful records that Nick Drake made in the late 1960s and early 1970s, which now command so much respect and affection – qualities which shine through in the Strange Face Project. It may sound a bit cheesy or even pretentious, but I feel enabled and empowered by having been there on Friday evening – enabled and empowered to carry on with my own project and think creatively about it, to relish human connectivity, to buck the trend of commercial motivation and exploitation. 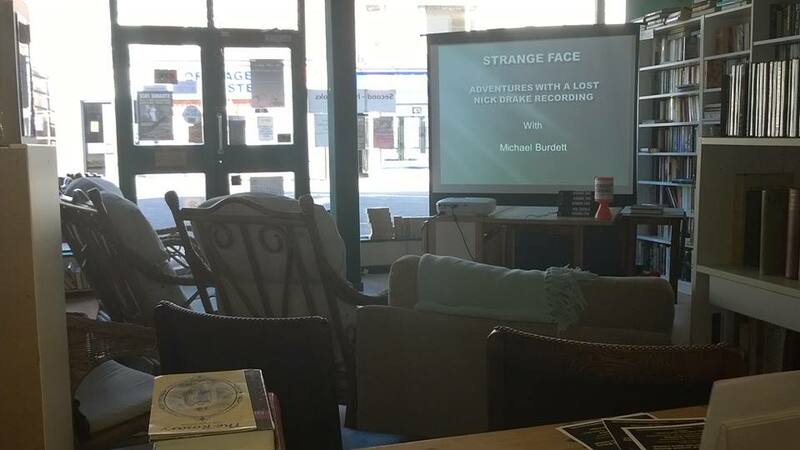 Do have a look at the Strange Face website – there is a book too, full of the photographs I have referred to, which is the next best thing to hearing the talk. Michael also uses the talk to highlight and support the work of Nordoff Robbins, an amazing charity that uses music to transform the lives of adults and children whose quality of life is compromised by illness, injury and other conditions. All in all a truly brilliant project, and I can’t thank Michael enough for bringing it to the Tree House.